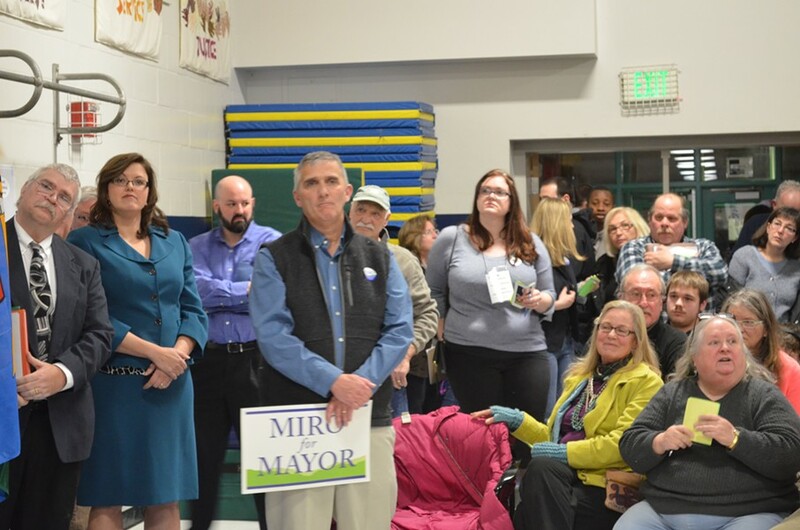 Dave Hartnett holds a "Miro for Mayor" sign at the Democratic caucus. His opponent, Carmen George, is in the blue suit. After losing the Democrats' endorsement last Sunday, Burlington city councilor Dave Hartnett will run for the North District seat as an independent. Throwing his weight behind the recently deposed candidate is the Democrats' highest ranking official in the city — Mayor Miro Weinberger, who is also running for reelection. Hartnett, a longtime moderate Democrat who is wrapping up his second term on the council, was snubbed by Burlington Democrats during their caucus in favor of Carmen George. A more liberal Democrat who previously served one term on the council, George called Hartnett out last Sunday for campaigning for Weinberger's Republican opponent, Kurt Wright, during the mayoral election three years ago. As Seven Days' Paul Heintz reported in this week's Fair Game column, Weinberger had announced his support for Hartnett ahead of the caucus as well. Outgoing Democratic councilor Bianka LeGrande, independent councilor Sharon Bushor and state Rep. Joey Donovan (D-Burlington) are also endorsing Hartnett, according the his release. Hartnett told Heintz he continues to identify as a D. "I'm a Democrat, and if the Democrats don't want me, they can kick me out, but I'm not leaving."